There is so much gardening to do I had no intention to blog this weekend. But after my cookie mishap this morning (which turned out fine), I cannot help but ranting a bit here. I woke up early and since it was too chilly to go outside, I decided to try out some cookies with the wonderful Meyer lemon scented olive oil I bought a few days ago. I found a Youtube recipe video that sounded perfect. I did not watch the video but followed the written recipe, modifying it a bit in terms of flavorings but making sure to stick with the ratio of dry and liquid ingredients. The dough was supposed to be rolled out and cut into desired shapes. There was no way that sticky dough was suitable to be rolled out so I put away my cookie cutters and dropped spoonfuls of the dough onto the baking sheet. The result was rather biscuits than cookies but they tasted good. For the next batch, I used a pastry bag and ended up with perfectly round little cookies. While the cookies were in the oven, I reread the recipe several times, wondering what mistake I had made. I had made none. Only then did I watch the video. The dough looks as sticky as mine, but then a heap of flour is added during the kneading. I cannot imagine those cookies will taste so nicely light as mine if you add so much flour for kneading. And, at best, the dough could be cut into plain circles, but “desired shapes”? I don’t believe it. The original recipe clearly did not work, at least not for me. Whether you are an experienced cook or a beginner, it is always a frustrating experience when a recipe does not work, and usually you assume that you did something wrong. But the sad fact is that there are lots of flawed recipes out there, some of them with plain errors, others leaving too much up to luck. I don’t want to sound judgmental, I acknowledge that recipe-writing is not an easy thing. The devil is in the details and there is plenty of room for errors. Of course I’ve made them, too. No more kvetching! After all I ended up with wonderfully light, lemon-scented cookies that I will surely bake again. But I won’t make a video out of it. Promised. 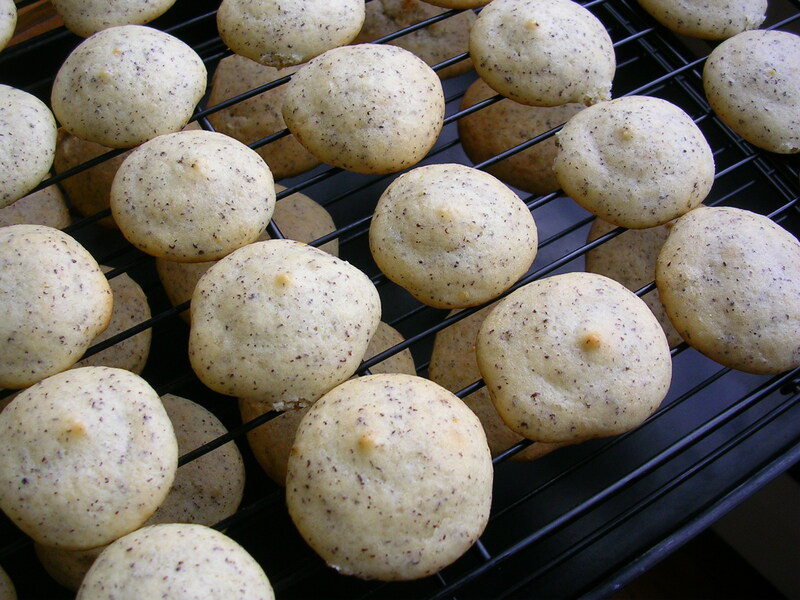 I used ground steamed poppy seeds that I brought back from Germany. In the US you can find ground poppy seeds (and I do not mean the sticky, gooey poppy seed cake filling) in specialty spice stores, or you can grind your own. If you cannot get your hands on ground poppy seeds, just leave them out. They are a nice addition but not essential to the recipe. 1. Preheat the oven to 375 degrees F. Line a large baking sheet with parchment paper or with a baking mat. 2. Zest the lemon and set aside 1 teaspoon. Refrigerate or freeze the rest of the zest for another use. Squeeze the lemon and set the juice aside. 3. Mix the olive oil, both yogurts, egg and vanilla extract in a bowl with an electric mixer. Add ½ cup sugar. 4. Put the remaining 3 tablespoons sugar in a food process with the lemon zest and process until the sugar is fragrant and slightly yellow. Add this the olive oil mix. 5. In another bowl, mix the flour with the baking soda, salt and poppy seeds, if using. Add to the olive oil mix and beat until fluffy. 6. Fill about one-third of the dough in a pastry bag with a plain round tip and squeeze small rounds, about 1.5 inch, onto the baking sheet, leaving ample space between them. 7. Bake in the middle rack of the preheated oven for 12 minutes, until the cookies are lightly yellow and set. Proceed the same way with the rest of the dough, which will make 2 more cookie sheets. 8. Cool the cookies on wire racks and store in airtight tins.